Dining room tables provide a comfortable and warm place to gather with family and friends for some of the most important moments of our days, so having a stunning dining table perfect for you is essential to the space of your dreams. 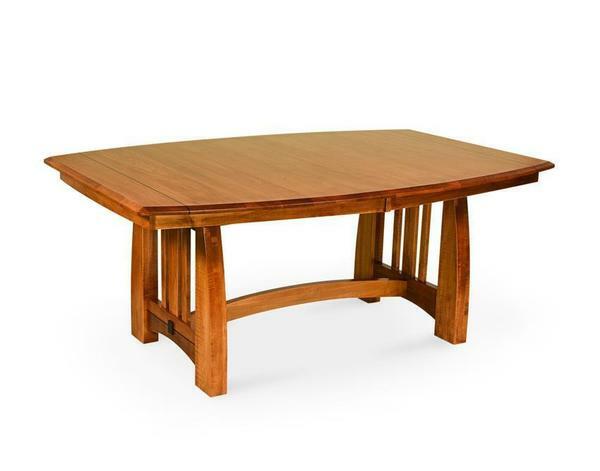 The Henderson Mission Trestle Dining Table is a gorgeous modern trestle bursting with beauty and charm. The trestle bases are complete with mission slats in the middle between two thicker sides curved stunningly adding to its charm. The stretcher between the trestle bases adds extra support while complementing the curvature of the legs. The Henderson trestle pairs well with a variety of mission dining chairs and benches to create a dining set sure to impress for generations. Call or email us today, and speak with a friendly and knowledgeable furniture specialist ready to assist you in creating the perfect dining table for your home! 1", 1 1/4" or 1 1/2"
Shown in Brown Maple with Malaguania FCN 3176.